In March we were able to visit the J.C. Arboretum in Raleigh, North Carolina, which was an amazing place. I was fascinated with the details of the Agave plants they had there. Agave is very beautiful, symmetrical desert plant. They form a rosette of thick fleshy leaves that each end in sharp spine. While Agave does share some characteristics of a cactus, it is actually related to the amaryllis and lily family. There are some species with smooth leaves rather than spiny, and there is a variety of colors. Most agaves are monocarpic, meaning they only flower once. Flowering commonly takes 10-15 years to occur in a garden, and often 100 years in the wild. During flowering, a tall asparagus-like stalk grows vertically from the center of the plant. The bloom of mother Agave plants are a beautiful array of pendulent bell-shaped, creamy-white flowers soaring high above the mother plant on a flower stem that may reach 20 feet or more for some agave species. The flower stalk is magnificent to behold, however, this event means the cycle of life ends for mother Agave and begins again for her Agave offspring. 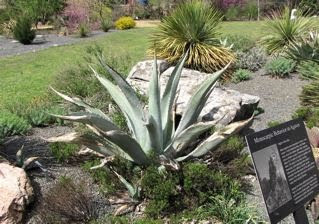 This plant is an excellent choice for rock gardens and is a perfect southern ornamental plant that requires no maintenance, doing best in well-drained soils and full sun. Agave nectar (also called agave syrup) is a sweetener commercially produced in Mexico from several species of agave. Tequila is also produced from an agave species in Mexico.